Here’s some recent photos to let you “see” some of what is going on at the homefront. This first photo shows Al in his doo-rag and may help people understand why he looked menacing to folks on the street! Here is Al with a friend from church, Ron, who had brain surgery a month before Al. They’re sporting their matching black eyes, bruising, and scars. 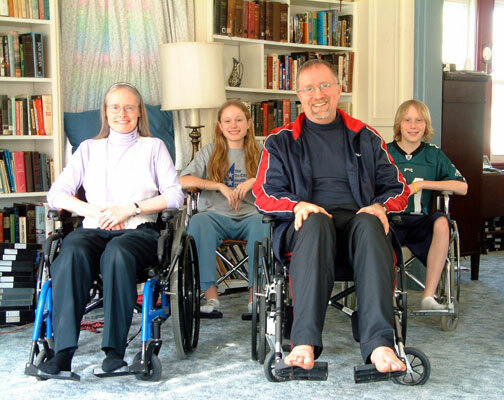 Ron’s wife Roberta reminded us that God has promised to heal Ron and Al. We don’t know yet whether he will do that on this side of the grave or the other, but the healing is absolutely guaranteed. 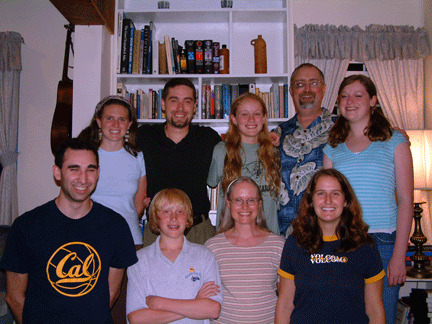 This is a shot of “our family,” including Andy (who lives with Alasdair and Lauren) and Melissa (who lives with Becky). It’s fun to be a family of 9. When we’re counting heads for a sizeable gathering we always start by saying “the nine of us” and then list whoever else is coming. Here are the names of people in the picture– back row from left to right: Lauren, Alasdair, Eowyn, Al, Rebeckah; front row left to right: Andy, Alden, Libbie, Melissa.